There is little question that the U.S. decision to schedule the embassy opening for May 14 was designed to be a major provocation. Some of the embassy backers, like the evangelical Christian Zionists John Hagee and Robert Jeffress who offered prayers and praise of Israel and racist hatred towards Palestinians, claim to speak in the word of God. They celebrate U.S. collaboration with the Israeli government to the tune of 3.8 billion American tax dollars that Washington sends directly to the Israeli military every year. Trump says the United States will always be a friend to Israel “and” support a lasting peace, only one of many such lies. The Trump administration’s decision to move the U.S. embassy to Jerusalem is about reminding the world that Israel is the strategic ally of the United States, and that Palestinians are not. This U.S. maneuver is not about protecting Jews: This is about Israel’s claim to the land of the Palestinians. Israel’s mass killing of Palestinian protesters in Gaza is part of that message: Palestinian land belongs to Israel, and Palestinian lives don’t matter. There is little question that the U.S. decision to schedule the embassy opening for May 14 was designed to be a major provocation. Of course, recognizing Jerusalem as the capital of Israel, and moving the embassy to Jerusalem in violation of international law and a host of UN Security Council resolutions, constituted major acts of aggression to begin with. Trump said the festivities were timed to celebrate Israel’s 70th birthday—citing the declaration of the state on May 14, 1948. But Israelis’ own celebration was based on the Hebrew lunar calendar, which placed the anniversary back in April. The United States chose May 14 because the day after is the Palestinians’ annual commemoration of the Nakba: the catastrophe of dispossession from their land, the expulsion of 750,000 Palestinians from their homes, and Israel’s continuing denial of those Palestinians and their descendants to exercise their internationally guaranteed right to return to their homes. And Nakba Day, as it is widely known, was to be the culmination of the Great March of Return. But plans for the Gaza protests were underway before the embassy opening was announced. Palestinians were continuing to protest the devastation of their lives in Gaza caused by Israeli wars against the impoverished, crowded strip of land. 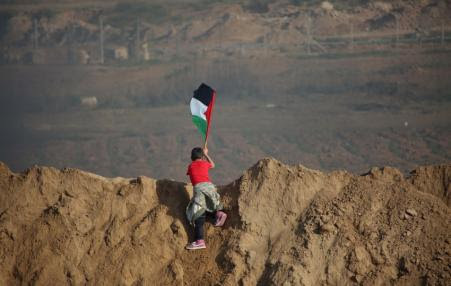 They were protesting the 11-year-old siege that has kept 2 million Gazans locked into an open-air prison, denied food, clean water, electricity and contact with the outside world, as well as air, the right to breathe, to travel, to leave and to return. Their demands started with the right to return, guaranteed by the Geneva Conventions and specifically guaranteed to Palestinians by UN resolution 194. So the protests on Monday were not primarily about the opening of the new U.S. embassy in Jerusalem. It is a familiar refrain. In another settler-colony, a couple of hundred years earlier, another high-ranking military officer, Col. John Chivington, commanded his Colorado militia to attack Chief Black Kettle’s Cheyenne encampment at Sand Creek. It was November 29, 1864, in the middle of the Indian Wars raging against indigenous people across the United States. Chivington ordered his soldiers to attack the families camped in the pre-dawn morning. Some soldiers resisted, saying that it would violate the military’s promise of protection to the peaceful village. Chivington, a Methodist minister, was having none of it. “I have come to kill Indians, and believe it is right and honorable to use any means under God’s heaven to kill Indians. … Kill and scalp all, big and little; nits make lice,” he said. An estimated 200 Cheyenne, most of them women and children, were killed in the Sand Creek Massacre. The Gaza massacre is a war crime. And the United States is complicit alongside Israel. U.S. funding of the Israeli military, U.S. protection of Israel in the UN so that Israeli military and political leaders are never held accountable in the International Criminal Court, U.S. provision of its own most advanced weapons systems to Israel—all of these actions make the United States a partner in crime and responsible for the slaughter of children, teenagers, women and men, journalists and medics. Challenging that U.S. support, demanding accountability for both Israeli and U.S. officials, remains a critical task, however distant its completion. People in the United States should be demanding an end to U.S. aid to Israel, petitions to congress, vigils outside the White House, sit-ins at the offices of Congress members determined to back Israel’s most extreme violations of human rights. All are needed, but none are sufficient. The legacy of Sand Creek, the legacy of Gaza, remain the legacies of massacres. It remains our obligation to respond. Phyllis Bennis is a fellow at the Institute for Policy Studies. Her most recent book is Understanding ISIS and the New Global War on Terror: A Primer (Interlink, 2015). This entry was posted on Monday, May 21st, 2018 at 10:33 am and is filed under Uncategorized. You can follow any responses to this entry through the RSS 2.0 feed. Both comments and pings are currently closed.